Chris Burden: Three Ghost Ships is a trio of actual sailboats that have been reconfigured and programmed by the artist to periodically unfurl sails, pivot rudders, and simulate navigation. 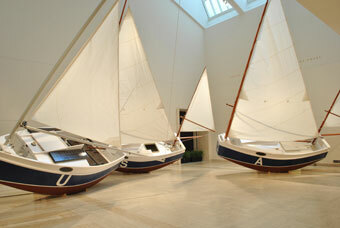 The sailboats seem to sail through the Museum’s sculpture court, with the beauty and innocent pleasure of sailing juxtaposed against the mystery and sinister undertones of unmanned boats sailing to who knows where. Three Ghost Ships (1991) epitomizes Chris Burden’s masterful fusion of real machinery and complex metaphor that has made him one of the United States most important sculptors.